The New Year is well underway. I don’t know about you, but for me, the dawning of a brand new calendar encourages me to freshen things up in the kitchen. Gone are the last few months of heavy, overindulgence (thank goodness! ), and in comes lightened flavors to get our bodies moving for the new adventures ahead. I love bringing fruit in to my meals as a way to punch up the flavor of traditionally savory dishes. It also means I’m getting important nutrients in too. It’s a great way to get on track and start the year off right. And though incorporating fruits into savory dishes may seem unheard of for some, it can awaken the taste buds by bringing in new flavors that play off of each other. Citrus is in season right now, and here is a recipe I’ve been enjoying: a healthy Edamame Salad with Avocado and Grapefruit. Of course, there are many ways to incorporate fruits into savory dishes all year long, so check out next week’s post for a recipe of Homemade Burger Patties with Fresh Lime Juice. If purchased frozen, boil shelled soy beans per the directions on the package. Add ½ cup to a bowl. Slice grapefruit in half and cut out its sections. Reserve the juice to drizzle on top of the salad for further grapefruit flavor. 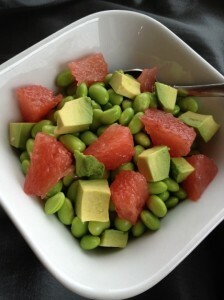 Add grapefruit sections to the edamame (I find half of a grapefruit is good, but add as many slices as desired). Cut the avocado in half and remove the seed. While it’s still in its shell, slice one half of the avocado lengthwise then crosswise, making squared pieces. Either scoop out the avocado squares with a spoon, or bend the skin inside out to remove the pieces. Add avocado to the bowl with the edamame and grapefruit (Again, I usually add half of an avocado, but please add however much you’d like). Squeeze in some of the excess grapefruit juice, toss gently, and enjoy.